Below please find an update on the total number of shares and units sold short across the four Kinder Morgan entities (as an indicator of how much traction Hedgeye’s short thesis is achieving in the market place). The following chart shows the total number of units or shares sold short for each name since September of 2012. The data is somewhat delayed and the data for January 31 was released on February 11. The short positions remain relatively small across the names with KMI and KMP showing longer term increasing trends. KMI’s short interest position hit a new high on December 31, 2013 and is only down slightly since then so its uptrend remains firmly intact. 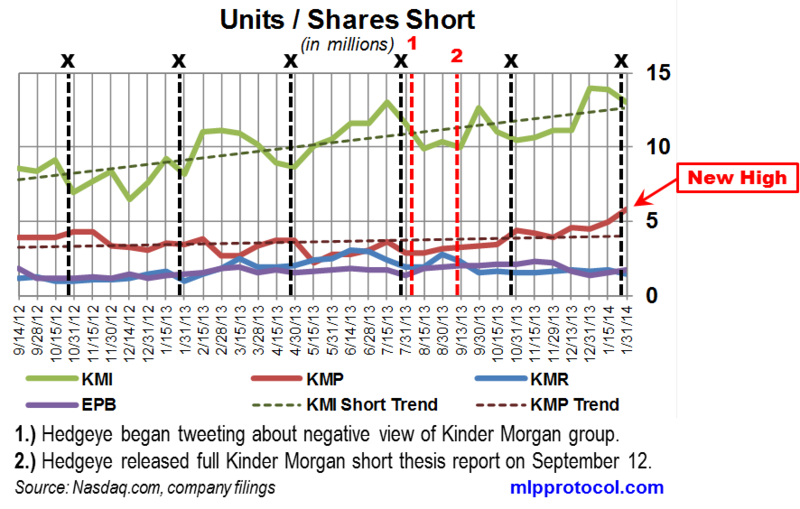 KMP’s short interest position just hit another new high on January 31, 2014 and is also clearly showing an uptrend. The rate of KMP’s uptrend also appears to have increased since August 1 (which indicates to me that Hedgeye’s short thesis continues to gain traction with some market participants). Some of the short position in KMP could also be on the books as a pair trade of Short KMP / Long KMR due to the current discount that KMR is trading at compared to KMP (~4.3% today). The KMR / KMP discount varies and at some point last year KMR had tightened in to be trading at the same price as KMP, so the hypothetical pair trade would have moved close to max profitability and probably been taken off. The KMR / KMP discount has varied widely over the years and was above 15% in 2009 and 2011, so the current level looks low and may not be worth the effort for the pairs trade (due to borrowing costs for KMP); however, just a theory to keep in mind for possible growth in the KMP short position if that discount widens out substantially.